What is the risk test? Everybody who has relatives with diabetes type 1 or 2 must undergo a this risk test to assess his/her own risk to develop one of these two conditions. This test is a new way to approach the patients with diabetes and their families. It is more convenient way to establish the risk for them to develop diabetes. “Risk” is the chance for you to develop diabetes. It does not mean that you are going to develop it. However, if you fall in the high risk category, there is a huge chance for you to develop diabetes however this is not a guarantee that you are going to have it. On the other hand people with who fall in the low risk group could develop diabetes at some point according to the ADA's risk test. How is the risk test carried out? You are going to be asked a series of questions. In most cases, the first question is going to be related whether you are male or female. Gender plays really important part here because males tend to suffer more often from diabetes compared to women. Age - is an important factor, which determines the risk for diabetes. It is correlated with your weight, height. These three factors are essential for proper risk assessment. Gender - Studies have shown that men usually go untreated because they are not diagnosed in time. Furthermore, they do not pay scheduled visits to the doctor. Ethnicity - People belonging to certain ethnic groups are more prone to develop pre-diabetes or diabetes than other groups. Obesity ( increased weight ) - is a factor, which increases the risk further. In addition, body mass index (BMI), which depends on height and weight, is determined, when you answer the questions about your weight and height. 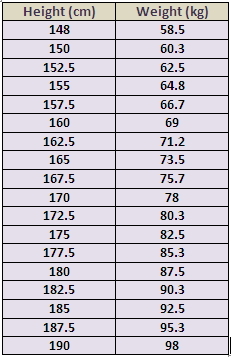 If your weight is not within the ranges shown in the following list, your risk to have diabetes is elevated. What is more, women who have given birth to babies weighing more than 4 kilos, have also increased risk to develop pre/diabetes. 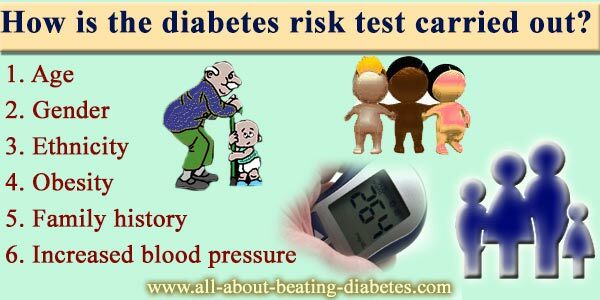 Family history - of people suffering from diabetes is another key point of the risk test. If relatives like: father, mother, sister and brother are having diabetes, this increase the risk for you further. However, if you do not have any sick relatives, then the risk will decrease. Increased blood pressure (hypertonia or hypertension) - is the last of the key factors, which contributes to the increased risk. If you are having high blood pressure, it has to be estimated the time that your blood pressure has been increased. The risk will raise if you have been long-time diagnosed with high blood pressure. That’s why you need to control your hypertonia to decrease this risk. The interpretation of the results is sometimes hard even for the doctors. Generally there are three different categories: Low risk, Moderate risk and High risk. Low risk - this is the group of people, who are young, healthy, without hypertonia, move actively, have body mass index <25, do not have relatives suffering from diabetes. Moderate risk - this is the group of people with pre-diabetic condition. Only the diabetes test is capable of showing that. The people in this group have some of the factors to develop diabetes in the future. High risk - these are people who suffer from diabetes. Some people understand that they have diabetes exactly through diabetes risk test. As you may see, simple steps of keeping naturally healthy can also keep you away from all kind of diseases, including diabetes.